Regal Pest Control offers a wide range of bird control services and product installations to address bird control issues for both residential and commercial customers. The services we offer and the products we use are designed to deter, exclude or remove pest birds. Our services are aimed at stopping pest birds from either roosting, perching or nesting in the areas where the products are installed or applied. We have solutions for issues as small as birds nesting in a home attic to large-scale commercial bird control applications. At this time, we do not offer services for woodpeckers or services for any wildlife caught in chimneys. We do not offer services for domestic animals. If you have any questions about the services we offer, please email us at questions@regalpestcontrol.net, send us a text message at 734-335-0219 or call us at 1-866-453-7221. YEARS OF EXPERIENCE. BIRD CONTROL DONE RIGHT. Regal Pest Control has provided bird control and removal services from the very start. Some of our technicians even have over 20 years of experience in bird control. We’ve learned a thing or two along the way and today we offer a wide variety of bird control products and services to remove, exclude and deter pest birds. Regal Pest Control specializes in removing pest birds from grocery stores and other large-scale commercial properties. We have provided bird control services at over 65 grocery store locations throughout Michigan. We’ve also provided bird control services and installations at sports stadiums, colleges, and many other large-scale commercial locations throughout the area. We offer cost-effective services and product installations for residential customers as well. We also offer thorough on-site inspections. Call or email us today to get a free quote! 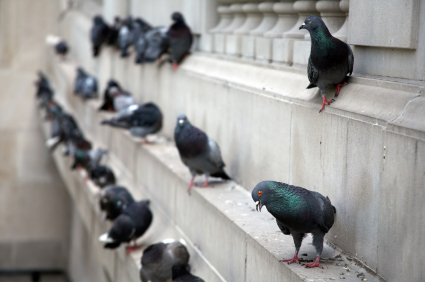 For commercial bird control applications, Regal Pest Control offers consultation services. A consultation involves conducting a thorough inspection of your location for any entry-points, identification of any current nesting or roosting sites and a detailed report highlighting our recommendations in removing any existing birds and the products or service procedures we that we recommend to exclude or deter birds from your location. Regal Pest Control guarantees that the products we install will be free from defects in materials and workmanship for a minimum of one year from the date of installation (some limitations may apply, call for details). Many of the products we install are covered with a guarantee greater than one year. Additionally, the manufacturer of the products we install offer a guarantee on the product function and integrity. For more information, please contact us at office@regalpestcontrol.net or call us at 1-866-453-7221. If there are any maintenance issues during the guarantee period, Regal Pest Control will return at no cost and repair and/or replace any deficiencies in the installation. We also offer an optional yearly maintenance program. This program consists of an annual inspection and repairing and/or replacing any faulty components in the bird control installation as needed. This will ensure that the bird control installation will continue to repel, deter or exclude the target pest birds.